Team TDP.ie. Left to right. Stephen Brady, Bob Stevens, Robert Thornton, Joanna Thornton, Christopher Costello. Click on Link Image to go to the I-Mag article. Text form the article printed on the 4th March 2015 in the Irish Independent bellow. BEFORE the recession hit in 2008, rallying was becoming a very popular sport in Ireland, but it was heavily funded by property developers spending on the back of a booming housing market. By 2009, as the recession took a tight grasp, the sport was virtually crushed on these shores, but one company saw potential in a rapidly expanding worldwide industry. Robert Thornton and his wife Joanna set up Trackday Performance – a highly focused mechanical engineering company for the motor sport industry – in the depths of the recession. Thornton used his experience managing engineering projects for the likes of Boeing and Ariand to form a company that would build and produce race engines, provide engine management systems and tune race engines, and have a machine shop element where it would manufacture its own suspension systems. “We set about designing a suspension system in late 2010, and launched it in 2011. It has gone on to win its first championship in Ireland and several other championships around the world. That established us as a product manufacturer,” says Thornton. As the company’s customer base of rallying and drifting enthusiasts grew, it noted that customers were referring to Trackday Performance as TDP, so it took the lead from its clients and rebranded to TDP.ie. After working with FormulaDIT, a team of manufacturing, design and mechanical engineering students from Dublin Institute of Technology, the firm took on two engineering graduates. Last year, it also took on a digital marketing manager through the JobBridge scheme. Albeit from a low base, the company grew by 30pc in the year ending 2013, and by another 50pc last year. Thornton is optimistic it can maintain that growth in 2015. The firm invested a lot of its resources in training and developing new products in 2014, and has entered 2015 with a much larger catalogue, introducing seven new products. 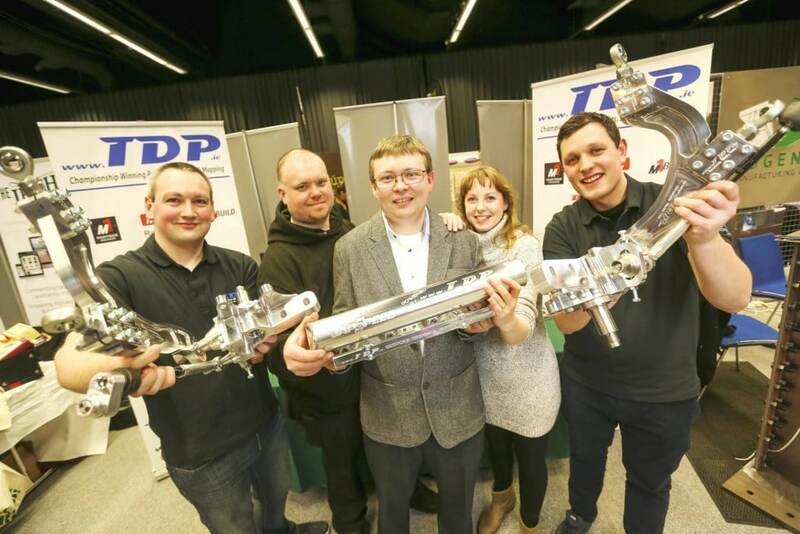 It now exports to every continent in the world, with its biggest market outside of Ireland and the UK being New Zealand, where one of its customers is leading the championship with a TDP.ie product. “We have a mantra in the office that there is no limit to the amount of innovation we do. We try and approach everything by the philosophy of ‘if there is a way to do it, we can do it better’,” says Thornton. “Our end goal is to be able to supply some of the manufacturers with our systems, and we see that happening in time. The more vehicles we can add to our range the greater our sales potential will be, because we are opening up our demographic market exponentially,” he adds.